I've followed with interest Ancestry.com's plan to launch a "Ancestry Labs" area so super-achiever members can test drive proposed new features of the site. This forward-thinking effort is to be applauded, and is another indication of Ancestry's revised marketing plan to involve member feedback in the development of the site. BRAVO! Person consolidation: A completely new way of searching our collections. We’d love to hear if it works for your ancestors. Click here for a quick video demo. Web records: More and more records are now going online on sites all over the web, many of them are free to access. Person View helps you find links to sites that contain records matching your search. Include or exclude record groups with the check mark. Ol' Myrt here heartily supports the new thinking at Ancestry.com regarding the links to Web Records defined as links to tens of millions of new records from hundreds of websites deliver a one-stop search experience. When I suggested this to an Ancestry.com official in a telephone conference after the FGS 2010 Conference in Knoxville, he immediately shied away, recalling the problems with caching content from other websites sites in Ancestry's now defunct Internet Biographical Collection. This new Web Records option lists a link, that one must click to go to another website for the content. The new Web Records option effectively removes the problem where Ancestry was keeping all the traffic, robbing the other website of click-throughs. Giving credit where credit is due is sometimes challenging with emerging technology. I think Ancestry.com's got it right this time. 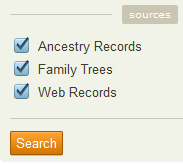 Web content providers can opt out of Ancestry.com's Web Record feature, but I think they'd be nuts to do so. Why close any door that can drive visitors to your family history site? The potential for sharing your message with other genealogists is greatly enhanced when a bigger genealogy website like Ancestry.com can guide them to your site. After all, Ancestry.com sponsored Who Do You Think You Are? on NBC here in the US, not us smaller genealogy website owners. Here's how you can tell the difference between an Ancestry.com hit, an Ancestry Family Tree hit (member provided) and a Web Record hit. In the example below, there are 3 Ancestry.com content hits, 6 member tree hits and 1 web record hit. What does the new "Person View" mean for the average researcher? Ancestry.com summarizes its own hit list of possibly related records and database entries in what their programmers consider a better interface. Ancestry.com suggests member family trees for possible collaboration. Ancestry.com points to other websites that may be useful in our research. If Ancestry.com's search engine works well, you may not need to go to Google and a gazillion other websites searching for content that matches your ancestor's name or locality. Kudos..let we experienced research better filter through available material. It is about time. I am anxious to try it! Maybe it will pop up something on my current projects brickwall. Ya never know. This reminds me of your Froman marriage record. Did you get the message Jackson County records are online? And does this Froman family go back to a large tract of land on Pollys Bend on the Kentucky River? Jacob Froman? I, along with my brother who co-hosts the site and other researchers for genealogy trails work hard to put FREE information online. We are volunteers and get nothing from it, except the satisfaction that we are helping someone. The idea of Ancestry STEALING our data so they can sell it infuriates me! I do not want my site included in your burglarizing spidering. It is in my opinion web piracy and should be stopped. It may not be illegal, but it is certainly unethical! I'm with Sue on this. And your post to encourage it is pretty misleading. Ancestry is taking the vital information from the free sites and making it available on their own site. Yes, there is a link to the free site but to obtain the main information a person does NOT have to visit the free site. Plus they are doing this without the site owner's permission. A site owner has to "opt out" and request that their information be removed. One site owner just learned Ancestry has already spidered several hundred pages of their site without their knowledge. Now Ancestry is going to have to remove it. There are going to be many site owners who don't even know this is happening to the hard work they have put out there to provide free data for researchers. I think Ancestry should spend their time in a more productive way such as getting data transcribed instead of scanning free genealogy sites and stealing others hard work. Right now this data they are collecting is free within the Ancestry site but there is no guarantee that it will stay that way and become available to only paid subscribers of Ancestry. Bottom line, this is totally unethical what they are doing and I question the legality of it also.